According to the 2016 American Community Survey, an estimated 31 percent of Central Florida households are considered cost burdened and carrying housing costs that exceed 30 percent of their income. Orange County Mayor Jerry L. Demings recently launched the Housing for All Task Force to address the crisis and propose short and long-term solutions by fall 2019. The Task Force held its first meeting on April 12, 2019 and is led by co-chairs Keewin Real Property Company owner Allan Keen and LIFT Orlando Chief Operating Officer Terry Prather. They lead a 37-member team consisting of leaders from a diverse group of non-profit organizations, major employers, real estate professionals and resident representatives from all six Orange County districts. During the meeting, Mayor Demings stressed the need to “roll up our selves” and act on finding creative, viable and sustainable housing solutions. The sub-committees will take the prior work from Orange County’s 2018 Regional Affordable Housing Initiative, analyze the recommendations and create lasting solutions for the Task Force to implement. The sub-committees’ first meeting is scheduled for Monday, April 29, 2019. All meetings are open to the public. Following the introductory meeting, Mayor Demings joined community leaders and residents on the 2019 Fair Housing Bus Tour, hosted by Orange County Government and Community Legal Services of Mid-Florida. Participants engaged in discussions related to the advancement of fair housing initiatives while visiting new affordable homes and public facilities across Orange County. “In addition to showcasing affordable housing properties, this tour will hopefully educate and advise people about their fair-housing rights,” Community Legal Services of Mid-Florida Managing Attorney Jeffrey Hussey said. The tour also commemorates the 51st anniversary of the passage of the 1968 Fair Housing Act and National Fair Housing Awareness Month in April. For more information on how Orange County is addressing affordable housing and for a list of Housing for All Task Force and sub-committee meetings, visit www.ocfl.net/HousingForAll. 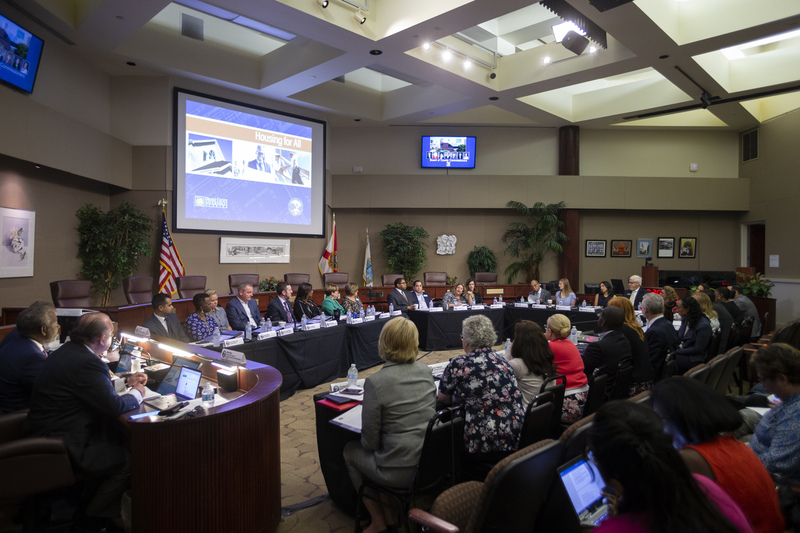 Photo Caption: Orange County’s Housing for All Task Force held its introductory meeting on April 12, 2019 at the Board of County Commissioner Chambers.